Hulu and Blumhouse’s monthly series of original horror films under the banner “Into the Dark” is really starting to erode any goodwill it may have once had with a third lackluster entry in a row. After December’s “Pooka!” and January’s “New Year, New You,” there was actually some reason for hope. But February’s “Down” was abysmal and March’s “Treehouse” wasted arguably the best cast in the series so far. 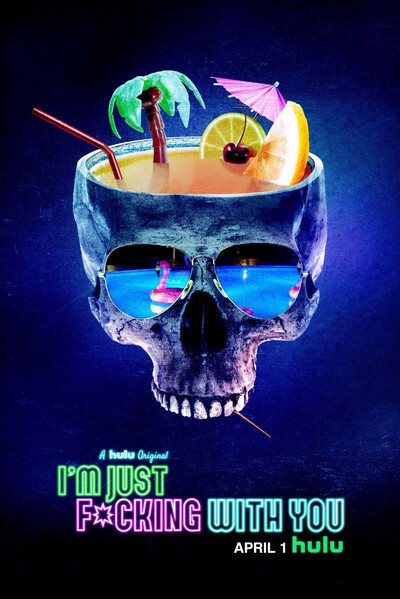 Which brings us to the very vaguely April Fools Day-inspired “I’m Just F*cking with You,” another “Into the Dark” that takes a reasonably strong concept and pummels it into dust with lackluster filmmaking and worse screenwriting. There’s a performance in this one that saves it from complete disaster, but even that can’t stem the bleeding from a series that is now batting 1.5 for 7. They’re running out of holidays to turn this franchise around. Keir O’Donnell stars as a milquetoast man named Larry, who’s headed out of town to do what he can to ruin an ex-girlfriend’s wedding day. In real life, Larry seems kind of meek, but he’s an aggressive troll online, using the anonymity of the keyboard to let loose his demons. The intention is to counterbalance the contrast between his online and IRL personas with that of an in-your-face prankster named Chester (Hayes MacArthur), who Larry encounters at an isolated motel. From the minute he checks him in, Chester is “f*cking” with Larry, and the film doesn’t disguise the obvious fact that Chester’s sense of humor is probably sociopathic. Larry presumes that Chester works at the hotel, but when a local cop doesn’t recognize him early in the film and asks where the owners are, anyone who’s ever seen a movie knows that Chester is a bit more dangerous than that annoying friend of yours. The only thing that keeps this iteration of “Into the Dark” afloat is the commitment of MacArthur’s performance. The “Angie Tribeca” star has excellent comic timing, and he knows how to keep Chester both engaging and dangerous at the same time. He’s a fascinating extension of the internet troll in that a lot of aggressive assholes on Twitter and comment boards are actually quiet, meek people in real life, but Chester is the opposite. He’s even more insane in person than on Facebook, and it’s his increasingly dangerous practical jokes that pull the two halves of Larry together, blending his ordinary IRL personality with his online bravado. As many interesting ideas as there are to play with in the concept and MacArthur’s work, Mason can’t manage the tone throughout and totally bungles the final act. Even before then, “I’m Just F*cking with You” starts to feel as annoying as Chester himself, with over-used style tricks and music choices. Quit quick-cutting to shots of online exchanges and slow down on the canted angles. Too much of “I’m Just F*cking with You” feels desperate in terms of its style choices, as if the team didn’t trust its concept or performers, dressing way too much of it up in amateur filmmaking decisions. And then the final act really goes off the rails, especially with a closing scene and cheap credits reveal. Kind of like how the whole film has been punking us too. Actually, now that I think about it, maybe the whole series has.